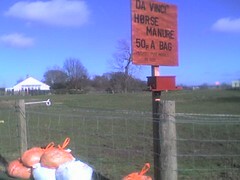 Right across the road from Rosslyn Chapel is horse manure for sale, under this sign. Had to take the photo, like all the other tourists. Actually, we took a wrong turn out of Edinburgh and stumbled on Rosslyn Chapel by mistake. We didnt intend to be here at all but needed to stop and eat a picnic lunch somewhere . . . so why not? well, dan brown’s characters are all pence-ive, so whatever. how ironic and iconic of you, dr. andrew!